Bos Taurus is a boutique, chef-driven American steakhouse located in the heart of downtown Bend. 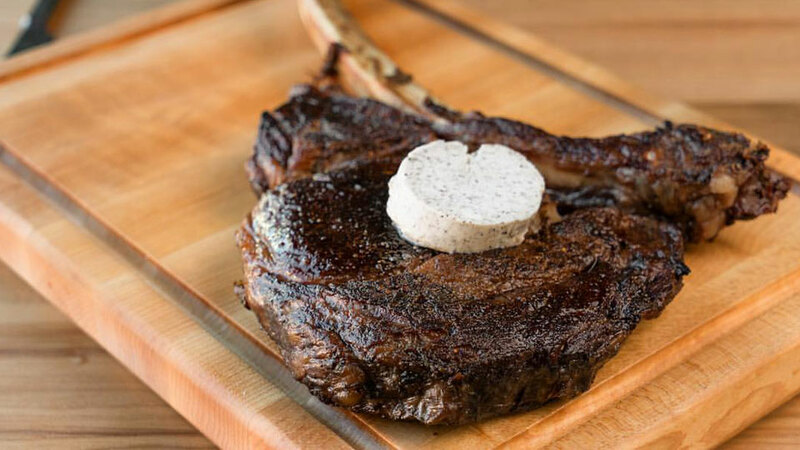 The open-air kitchen is built on the chef’s commitment to sourcing the highest quality beef from around the globe and centered around a custom cast-iron slab designed for a perfect sear. The interior is chic industrial with a Northwest flair that invites you to settle in any evening of the week for dinner or happy hour, or both, and enjoy an exquisite menu accompanied by a vibrant, professional service team. Bos Taurus loosely translates to “so many head of cattle” and the restaurant lives up to that definition, sourcing beef from all over the world, including A-5 wagyu from Japan, Australian wagyu and the best sourced beef in the US. Each beef entrée is accompanied by a selection of knives for guests to choose from, allowing them to give their perfect cut the perfect cut. A selection of non-beef items round out the menu and all entrees can be easily paired with Bos Taurus’s extensive list of wines from around the world and signature cocktails. Reservations are strongly suggested but the bar is available for walk-in guests.